Paul, left, and Margaret Cook, of Sidney, share a hug during the celebration of their 70th wedding anniversary, recently, at Ohio Living Dorothy Love. SIDNEY — Margaret Renner was born Nov. 5, 1924, in Mayville, New York. One day later, Paul R. Cook was born in Homer, Louisiana. 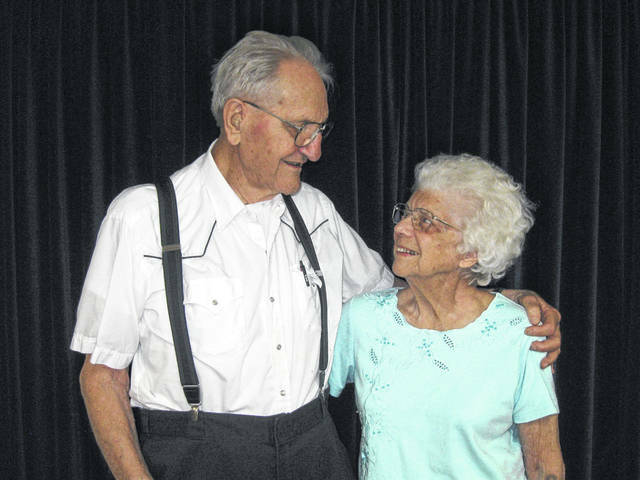 It would be 23 years before they met each other, but meet they did, and Aug. 14, 2018, they celebrated their 70th wedding anniversary. It was at Camp Pinnacle, owned by the Albany Bible Society, during a hike along a bluff that the two first talked. Paul had moved with his family to New York state when he was 15. Following high school graduation, he joined the Army, serving during World War II in an engineer heavy shop company in Europe and on Okinawa. Discharged in March 1946, Paul enrolled in Rensselaer Polytechnic Institute in Troy, New York, in February 1947. “RPI had a system: if you had a grade point average of 3.2 or higher, you were exempt from final exams. In English, the professor thought I had to be checked out a little more, so I had to take the exam,” Paul said. However, there was a week between the end of classes and the English exam. So Paul went to church camp. On the first day of camp, there was a hike in a state park nearby. The trail went along a bluff and was so narrow that just two people could walk side-by-side. Paul walked with a college friend, and the young men noticed that two girls were walking just ahead of them. It wasn’t long before the friend had left Paul to walk with one of the girls. It wasn’t exactly love at first sight, though. Margaret didn’t even ask Paul’s name. But the next day, while swimming in the park lake, she cut her toe. Paul and his Buick helped her get first aid and to get around camp. At the end of the week, he put her on a train for Mayville. His plans called for a return to Louisiana for a job on an oil rig and a summer with his mother. “I didn’t trust my car to get to Louisiana, so I started hitchhiking. That was a good way to travel in those days,” he said. He thought for a moment about whether he should try to get to Mayville, but when a ride materialized that took him all the way to Cleveland, he didn’t think twice. In Cleveland, at the railroad station, he spent what money he had, “except a dime,” he said, on a ticket to Hope, Arkansas. He talked with his seatmate, a woman, most of the ride, and told her that he planned to hitch from Hope to Louisiana. When he took a break to stand between cars for awhile, she got their fellow passengers to donate toward a train ticket for him to ride the rails all the way. At summer’s end, Paul stopped in Mayville for a visit on his way back to college. The two got together another four times during that school year, and on Easter, he proposed. “I told her that I thought the Lord was telling me that we should get married. That was something I said I’d never do: get married before I finished school,” Paul said. They were wed in the First Baptist Church in Mayville by the Rev. J. Arthur Murfin. Ruth Joyce Minic, Murfin’s fiancee, was maid of honor. Margaret’s sister, MaryLou Renner, was a bridesmaid. Paul’s brother, Louis S. “Pete,” served as best man. 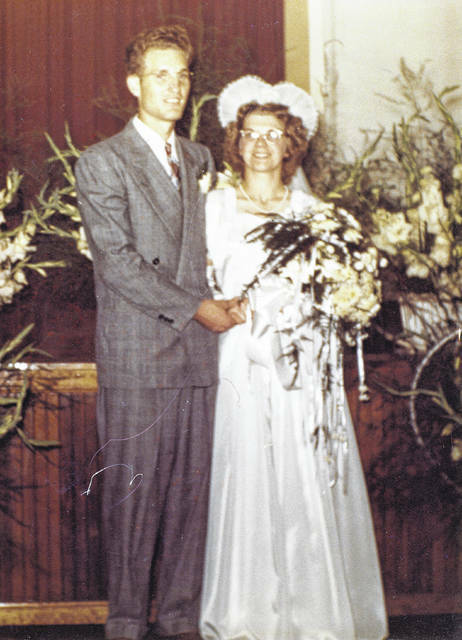 Soon after the wedding, the Cooks moved to Arkport, New York, where Margaret got a teaching job, and Paul, who had switched his major from engineering to theology, enrolled in Houghton University. “The Lord said I should be a pastor,” Paul said. He applied to Houghton and was rejected. “But God said Houghton. He’s more in charge than others. A week later, I got a letter: would I teach mechanical drawing to students at Houghton? That opened up the chance for me to study there. Life is full of those things, where it was close and somewhat miraculous,” Paul said. When their daughter, A. Sue, was born in 1949, Margaret stopped teaching home economics and became a full-time mother and homemaker. Paul graduated with highest honors in 1951 and became the pastor of Chemung Baptist Church in Chemung, New York. “I had a great six years there,” he said. On the side, he drove a school bus and decided to become a teacher. He was chosen as a DuPont fellow at Cornell University, where he completed the coursework needed to be licensed as a math and science teacher. “Our son, Peter, was born while Paul was at Cornell,” Margaret said. Sue, now A. Sue DeSantis, lives in West Milton. Peter lives in San Benito, Texas. The Cooks have five grandchilden and 12 great-grandchildren. Paul taught physics, science and math in Naples, New York, and pastored a church there for three years. The family then moved to Westfield, New York, and Paul taught in the Brockton, New York, schools for 25 years. Margaret served as a substitute teacher for 20 years in three districts. They purchased a 100-year-old farm house and rehabbed it. “After we retired, we got involved in Christian camp ministries,” Paul said, until he developed vertigo and a balance problem. In 2004, at the suggestion of their daughter, they moved to Ohio Living Dorothy Love. The two of them are on the retirement center’s championship shuffleboard team. Margaret, always an accomplished seamstress and quilter, leads the quilting group and presents programs about quilting to nursing homes. Paul spends lots of time in the woodworking shop, creating beautiful, turned plates, candlesticks and bowls. Both have won ribbons, proudly displayed on the walls of their workroom. The couple celebrated their milestone anniversary with a party in the Amos Community Center at Dorothy Love. Other residents attended, and Cook family members came from as far away as Texas, Louisiana, Florida and Illinois. “Three carloads came from New York state,” Margaret said. Paul crafted 18 bowls of various woods to give as favors. “I put two bowls on each table. I said they could take them home if they could decide who got them without fighting,” he said. “There weren’t any fights,” added Margaret. “It was a great party. The two have had eyes only for each other since they met. It was their Christianity that attracted them in the beginning, and it’s what has kept them together for 70 years. Today, they are members of the Good Shepherd’s Baptist Church in Sidney and also usher and participate in Bible studies in the chapel at Dorothy Love. “He fit in,” Margaret said about what she saw in Paul. Her husband echoed the feeling. “I had only dated one girl before Margaret. She just seemed to fit in,” he said. What advise would they give to young marrieds about how to achieve seven decades of mutual affection?